Synergy Blue announced the placement of its first certified skill-based games – Zombie$ and Safari Match – on the floor of the Augustine Casino in California today. Featuring Synergy Blue’s patented HAWG (Hybrid Arcade Wager-based Gaming) platform, the machines are class III, GLI11 certified, and will be joining approximately 800 slot machines on the Augustine’s gaming floor. While the games provide the typical RTP that casino operators expect from traditional slot machines, even in skill-based mode, the games also offer a more engaging playing experience. It is Synergy Blue’s hope that the games will help bring a new generation of gamblers into the casino, particularly gamers like Georg that have similar memories of feeding quarter after quarter into games that provide a superior gaming experience to home gaming systems. Zombie$ is a first-person shooter in which the player takes the role of a mercenary hired to clear out a grotesque zombie infestation and uncover its root cause. 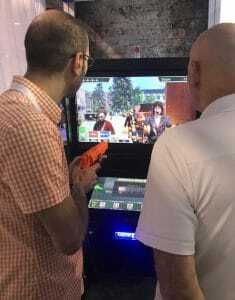 Rather than utilize a touch-screen for gameplay, Synergy Blue opted for a more reactive and immersive gun controller, like one you might see on SEGA’s House of the Dead or Atari’s Area 51 in the mid-90s. Each time the player shoots, a wager is placed, so precision and patience are rewarded. 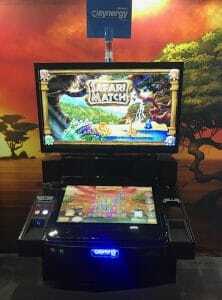 Safari Match is a match three puzzle game and, with its precise touch controller, is designed to appeal to a wide range of gamers. Basic gameplay is simple and easy to learn, but the game greatly rewards players that are skilled enough to match five, six, or even seven tiles in a single move. Matching more than three tiles activates a bonus wheel; the more tiles the player has matched, the better the bonus wheel. Players that match seven or more activate the double wheel bonus which combine to offer up to 250 times the player’s bet. Given their immersive, arcade-style gameplay and engaging content, Synergy Blue’s games are likely to make a splash on Augustine’s casino floor. Author’s note: I had a positive experience with Synergy Blue’s games at G2E 2017. Read more about that here!